Contributors Fundamental Analysis ECB Preview: Dovish Draghi Expected, So Could EUR/USD Rise? 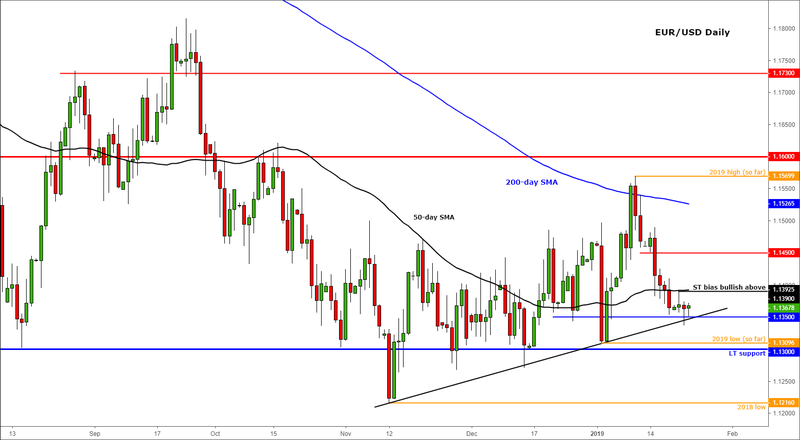 ECB Preview: Dovish Draghi Expected, So Could EUR/USD Rise? The European Central Bank’s next policy ‘decision’ will be made on Thursday, but the focus will undoubtedly be on President Mario Draghi’s press conference. The ECB is widely expected to announce no new changes to its policy. But Mr Draghi may deliver a cautionary outlook on the economy and therefore interest rates amid the recent weakness in German and Chinese data, and ongoing Brexit uncertainty. The euro’s recent weakness certainly suggests market participants are indeed expecting to see a more dovish than hawkish Mario Draghi. Therefore, with the expected dovishness at least partially priced in, the euro may not react too negatively if he does say what the market already expects. In fact, one has to wonder whether the risks are actually skewed to the upside for the single currency, as almost everyone appears to be bearish on the Eurozone economy and inflation outlook. Thus, any surprisingly hawkish comments from Draghi could see the euro stage a quick rebound. Since the ECB’s last meeting on December 13, Eurozone data has remained on the soft side. In fact, the latest consumer inflation data showed prices eased to 1.6% year-over-year, down from 1.9% previously, although core CPI remained unchanged at 1.0%. In addition, we saw some rather disappointing Eurozone manufacturing and services PMIs for December, with French PMIs falling below the boom/bust level of 50. The latest PMI data for the month of January will be released tomorrow, ahead of the ECB decision. With Brexit uncertainly rising further and Eurozone data not improving since the ECB’s last meeting, it is hard to see how Mr Draghi will convince the markets that interest rates will still go up, as planned, at the end of the summer. Perhaps the only good news for those concerned about a big drop in the EUR/USD exchange rate on Thursday is that the dollar hasn’t exactly been surging higher over the past couple of months. This is because the Federal Reserve has turned dovish in that it has indicated interest rates will not be going up for a while. Obviously, that doesn’t necessarily mean that the exchange rate won’t fall sharply on Thursday, but the not-so-hawkish Fed does help limit the potential gains for the dollar, and the losses for the EUR/USD. From a technical perspective, the EUR/USD is currently sitting above the long-term 1.13 support, but it has been taking its time to move away from this level. So, it has no clear directional bias with price trading inside a very narrow range over the past several months. Obviously in recent days it has been trending lower but in the grand scheme of things, it remains more or less directionless. It will be interesting to see if, after Thursday’s ECB meeting, the EUR/USD will still be holding above its short-term bullish trend line around 1.1350. If it loses this level, then a re-test of this month’s earlier low and the long-term support around 1.1300 could be on the cards. The next big level below 1.1300 is last year’s low at around 1.1215. On the upside, Monday’s high around 1.1390/5 is important to hold for the bears. But if we go above it, then this could lead to a short squeeze bounce higher, possibly towards the next potential resistance at 1.1450. The next level above that is this month’s earlier high at 1.1570. So, ahead of the ECB day, the EUR/USD is trading near a key short-term support area. Whether or not it will hold or break depends almost entirely now on the ECB. But we think the risks are skewed slightly to the upside given the level of bearishness towards the eurozone economy and the single currency, which may be already priced in. Still, as much as I hope I am wrong, we can’t see a massive move in either direction. DISCLAIMER: The information and opinions in this report are for general information use only and are not intended as an offer or solicitation with respect to the purchase of sale of any currency. All opinions and information contained in this report are subject to change without notice. This report has been prepared without regard to the specific investment objectives, financial situation and needs of any particular recipient. While the information contained herein was obtained from sources believed to be reliable, author does not guarantee its accuracy or completeness, nor does author assume any liability for any direct, indirect or consequential loss that may result from the reliance by any person upon any such information or opinions.